The i8085, Z80 and NSC800 expansion tools allow the MCS-80 test-board to test the function of Intel 8085 (and compatible), Z80 (and compatible) and National NSC800 CPUs. The test tools are connected via the ZIF socket for the i8080 CPU and into the 3×16 pin header connectors of the MCS-80 test-board. 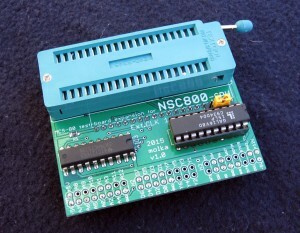 There is no need to modify or replace anything on MCS-80 test-board. They can be easily installed and removed to test different families of processors. The expansion tools disable the i8228 system bus controller and take over the control of MCS-80 system bus. They use the same 1.11MHz clock signal generated by i8224 clock generator. 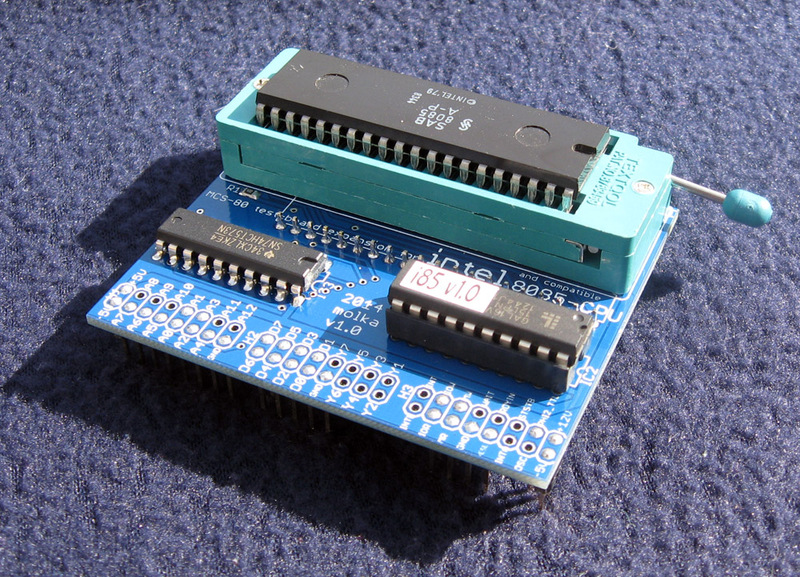 The EPROM based test program for the i8080 also works seamlessly for 8085 and Z80 CPUs. This is possible because both the Z80 and i8085 CPUs are based on the Intel 8080 processor, while the NSC800 is an enhanced Z80. The 8085 is nearly the same as the 8080 from a software point of view, Intel just greatly simplified the hardware required to support it. 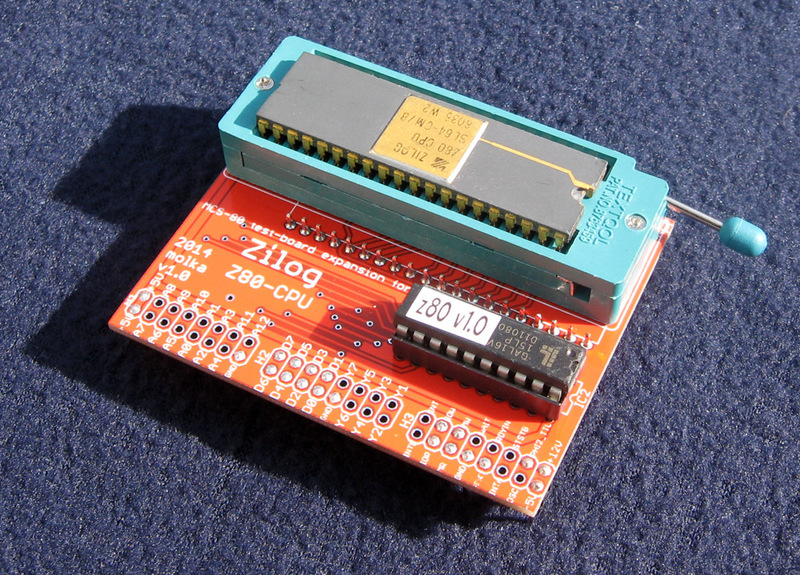 The Z80 was designed by Federico Faggin who before founding Zilog, designed the 8080 at Intel. It is a great improvement in both hardware and software from the 8080 but retained a compatibility mode with the 8080. This allows the MCS-80 test board design to support the Z80 as well as the 8085 with no modifications to the board itself, or the programming. If you purchased one of the very first MCS-80 boards that does not have the header installed, one can be provided at no charge. All you will need to do is solder it in. The current boards all have it pre-installed. If you cannot solder in the header we can do so for you for a small fee ($15 including return shipping in the USA, or $20 outside the USA). Turn off the power of MCS-80 test-board and unplug the power cord. Remove the i8080 CPU (if present) and leave the release lever of the ZIF socket open. Insert the pins of the expansion tool carefully, first into the ZIF socket and then adjust the pins into the header connectors of MCS-80 test board. Push the expansion tool’s pins gently into the header connectors of test-board, ensuring they are aligned properly, and then lock the ZIF socket of MCS-80 test-board. Insert the CPU to be tested into the expansion tool’s ZIF socket. Ensure proper orientation to prevent damage to the test board and CPU! Pin 1 must be at the upper-right corner, next to the release lever of the ZIF socket. Then lock the socket by moving the lever down into the lock position. Plug in the power supply and switch on the power of the MCS-80 test-board. The boards can be removed by reversing the process. Download the Expansion board manual (PDF).